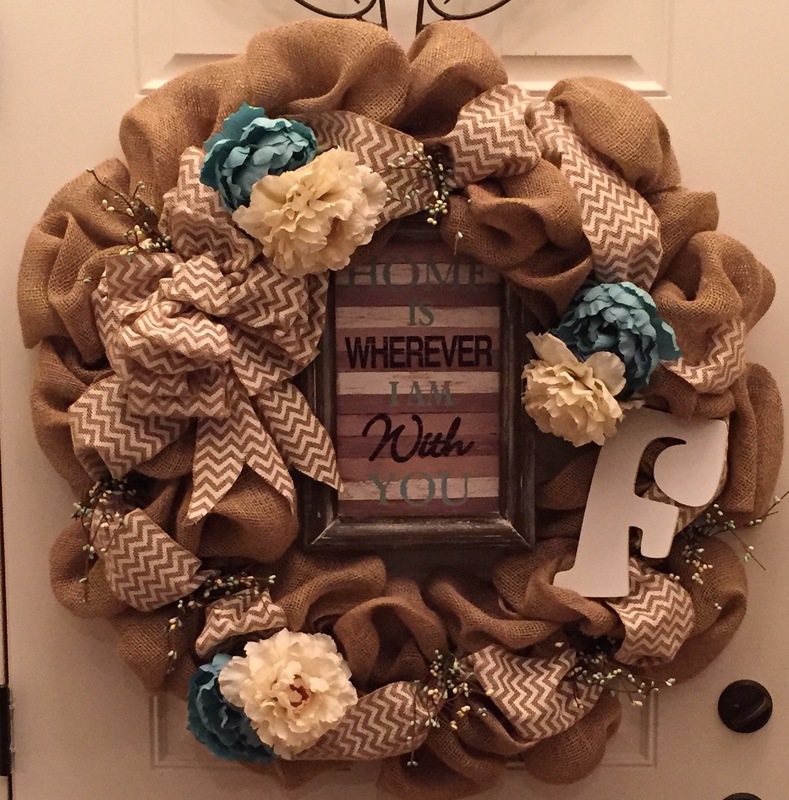 I decided I would try again (I am nothing if not determined to try and try again until I’m satisfied with the end result) and so I set myself to the task of making a burlap wreath for our front door, I wanted it to be quite large because our home sits pretty far back from the road and I wanted to be able to see the wreath on the front door from our cul-de-sac. So off to Hobby Lobby I went yet again and I began to gather my supplies. 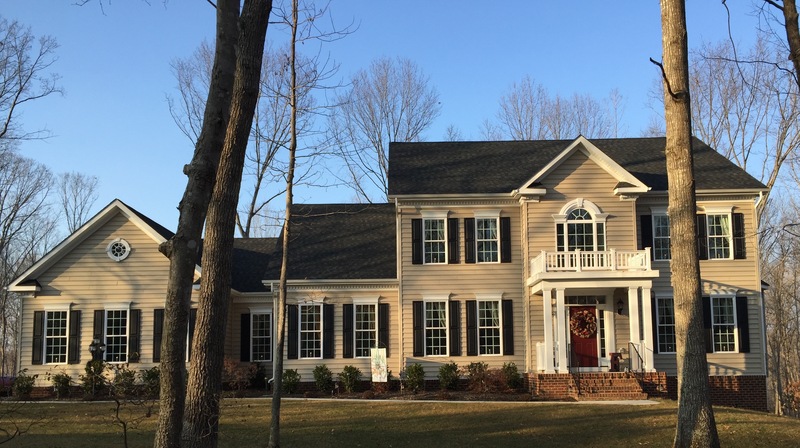 The first thing I picked up was a 24″ metal wreath form with the twist ties already attached. I then collected all of the other things that I thought I might need to make my wreath. 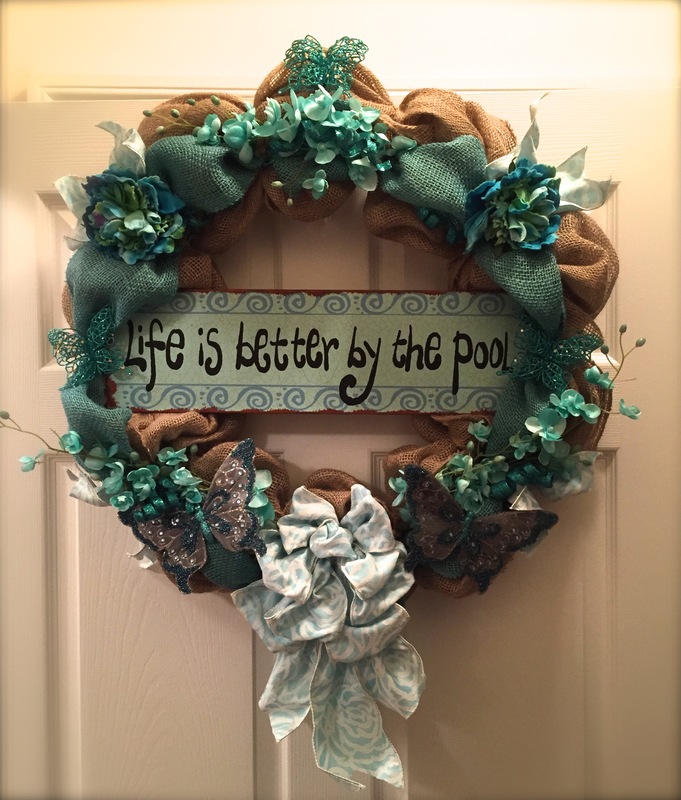 I will try my best to put into bulleted form how I constructed not one but 2 burlap wreaths for my front door…yes, I said 2…lol…I made one for the inside of the door too. 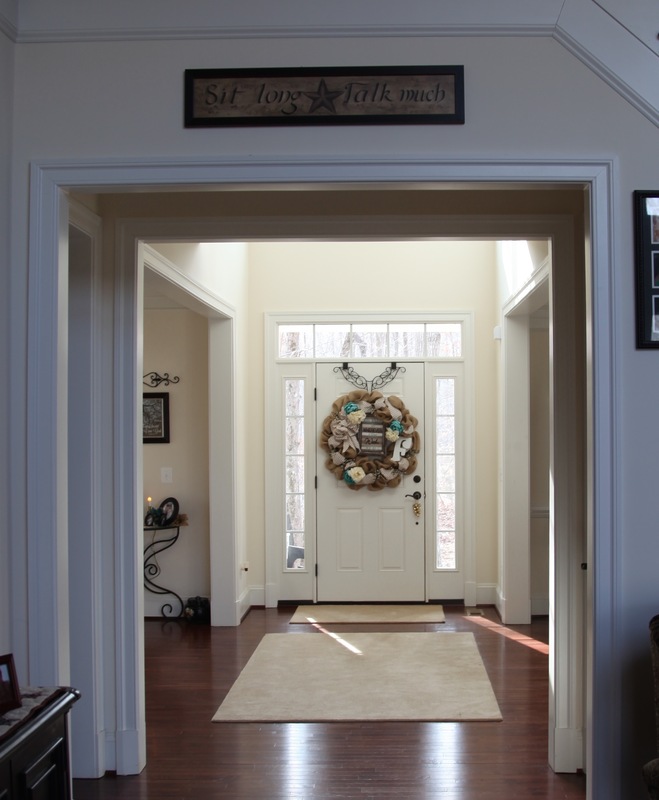 We found a wreath hanger that we could manipulate over the door that provided a hook on either side of the door. 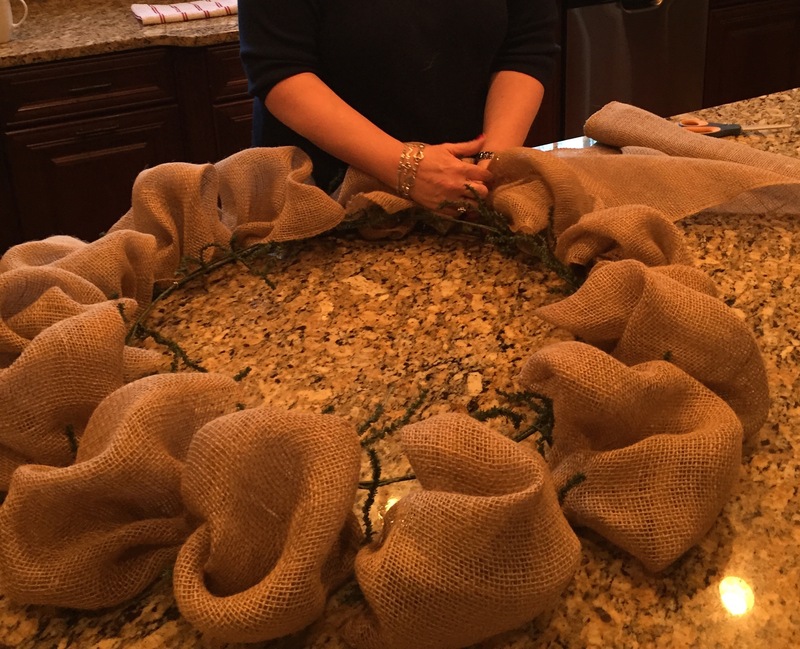 I was very happy with what I ended up with and I have made many other burlap wreaths since, so many that my hubby has made me a wreath hanging station in our basement. 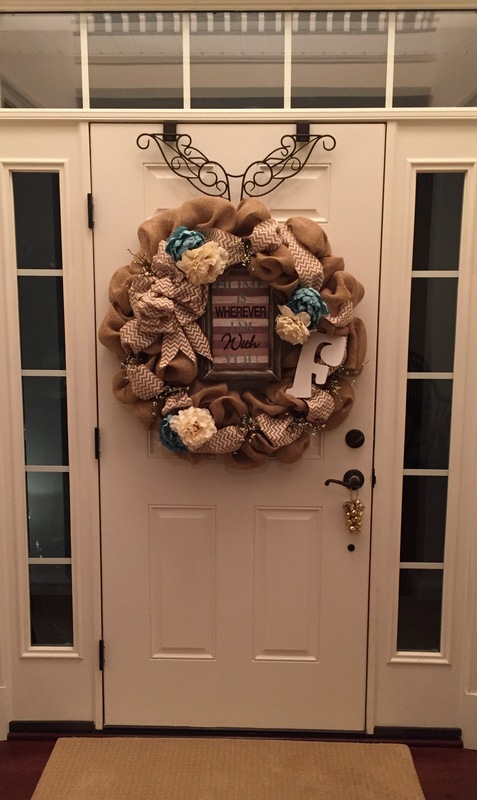 In another blog, I will post a bunch of pictures of the burlap wreaths that I’ve made, some for my own use, a few for gifts, and one or two for friends who sweetly asked me to create one for them. 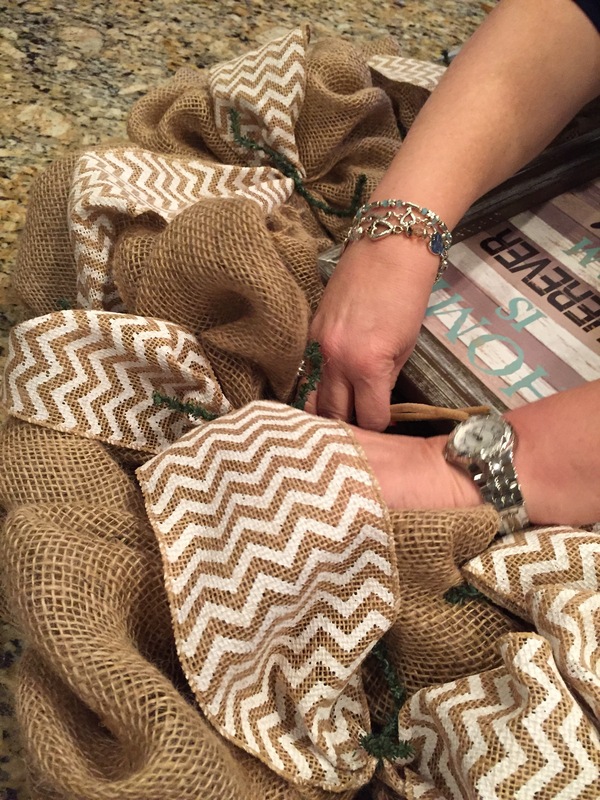 *Work your way around the wreath form starting on the outside ring gathering and catching burlap into each pipe cleaner and then moving to the inside ring and doing the same thing. 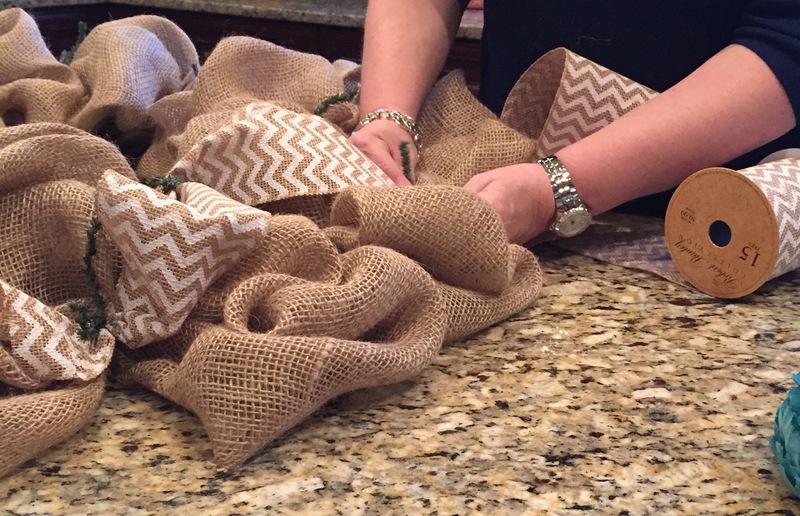 I’ve seen some people online who measure the length of burlap that they put between each pipe cleaner, I do not do that, I just eyeball it and go for it. So once you have your outer and inner rows of burlap attached to the form, add your coordinating colored burlap or ribbon catching it into one of the outside pipe cleaners (by untwisting the pipe cleaner and adding it to the burlap that you already caught) and working to the next inside pipe cleaner, then back to the outside and so on all the way around the wreath. *Take a moment to glue pipe cleaners to the back of anything you might want to attach to the wreath form as you see me doing in the picture below. *Then start attaching anything else that you’d like to put on your wreath either via the pipe cleaners that you attached, or directly into some of the pipe cleaners (you’ll see what I mean in the pictures below–SO hard to explain). 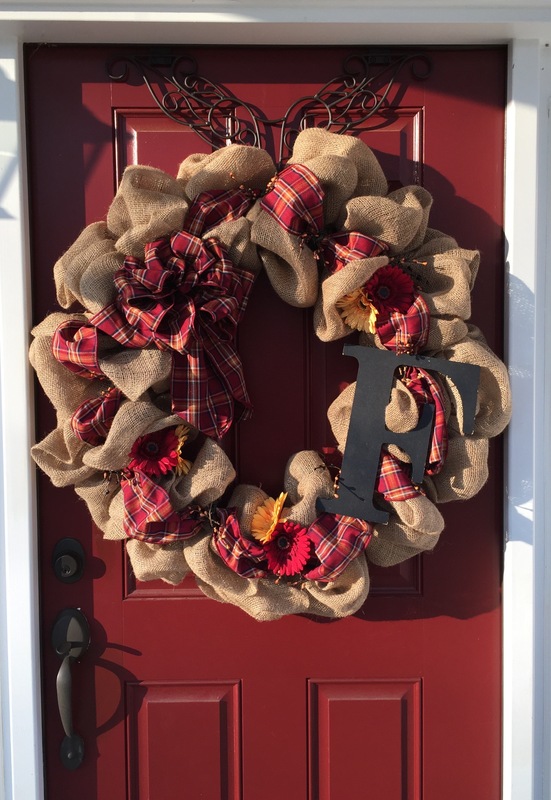 I chose slightly different things for each wreath, I chose to put our last name initial on both wreaths as well as a bow (that I made…I’ll need to do another blog about how to make a bow huh?) on both. 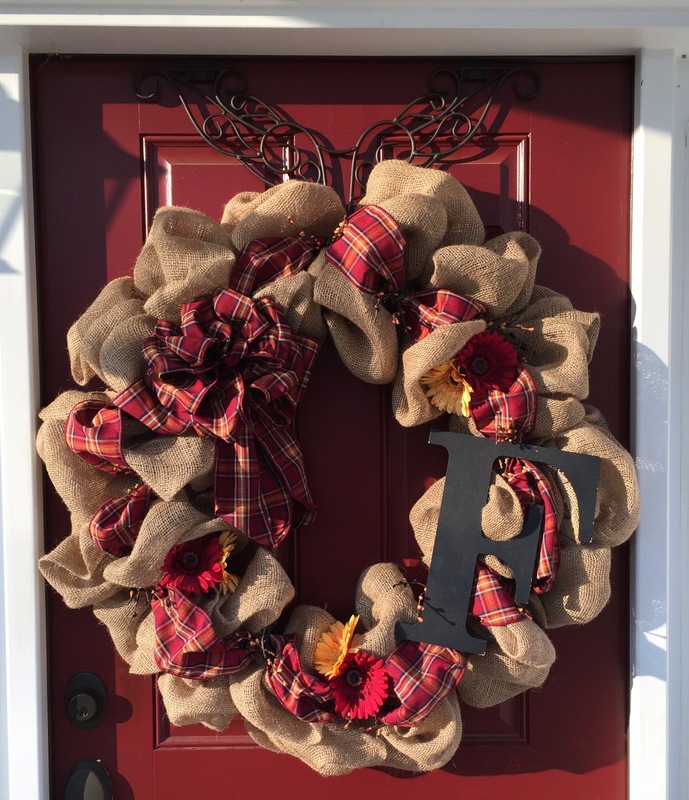 Then I chose other specific items for each wreath consisting of pip berries, gerber daisies for the outdoor wreath to match our red door and the coordinating ribbon, other silk flowers and a wooden framed picture for the indoor wreath to match my room decor. Definitely imagine that that you said. Your favorite reason appeared to be at the net the easiest factor to bear in mind of. I say to you, I definitely get annoyed even as people consider worries that they just do not understand about. 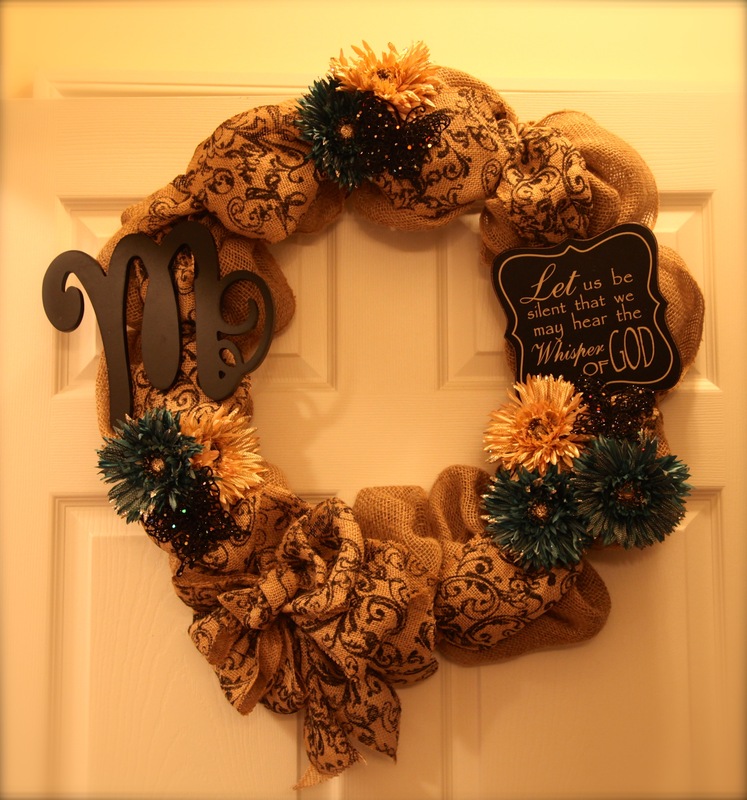 I showed this post to my sister, who’s daughter wanted an Initial Wreath for her new front door (of her new Home). She used your step by step to make a lovely wreath. Thanks!